We couldn’t live without our two four-legged friends Pepsi and Jake, and neither could you, right? But the pet hair they leave everywhere is a nuisance! We’ve tried many fur removal brushes and other products over time, but just couldn’t find ‘the one’. Vacuum cleaners were too noisy and expensive, lint rollers - too awkward. We needed something better! So we made our hair picker better– for our family, and yours! Improved Handle and Base: PET ASSISTANT’S non-slip handle and base gives it a more comfortable grip, making it easier to wipe those annoying hairs off. The NEW hanging hole means you'll never have to scour through your drawers! Better Self-Cleaning System: It’s extremely easy to clean the brush - just dip it in the base to get the hair off. Yet, we know that cleaning the base is a tricky job, so we designed a compact brush to remove the hair from inside super quickly. Use a drop of soap with it, and your fur remover will never get smelly (like many others do). 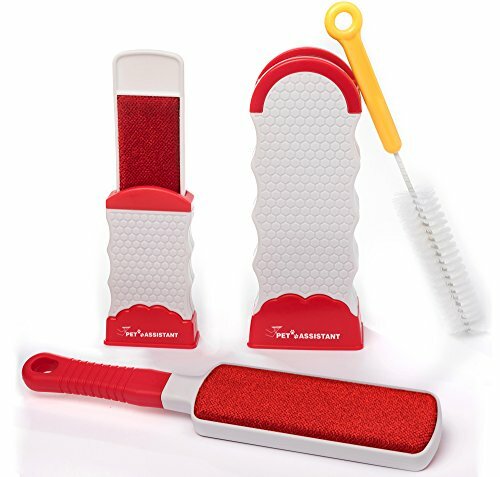 Slicker Design, Red Color: We also gave our fur remover a ‘makeover’ - gone are the days of having to hide it in the drawer! We had a vision of an ideal fur remover - and a mission to turn it into reality. With PET ASSISTANT, we can love our dogs and enjoy a fur-free home, and we hope that you’ll love it as much as we do! REUSABLE, NO REFILL,No tape - unlike a lint roller for pet hair! Economical, DOUBLE-SIDED fur remover and cleaner for a fur-free home. IMPROVED SELF-CLEANING SYSTEM that included another brush to clean hair residues from inside the big brush base & travel size brush- SET OF 2 BONUS BRUSHES - forget the mess in the base and the funky smell! get rid of the shedding hair! QUICK & EASY - removes and cleans fur and lint from clothing, couch,fabric and upholstery like magic! TWO simple steps to cleanup! NEW ERGONOMIC HANDLE & BASE- large size and soft handle gives a more comfortable hand grip useful as pet hair remover for Furniture , with an Extra easy storage, hanging hole. NO FALSE PROMISES - Our double sided brush will do a fantastic job with short & long hair - or your money back! If you have any questions about this product by ORLY`S PET ASSISTANT, contact us by completing and submitting the form below. If you are looking for a specif part number, please include it with your message.